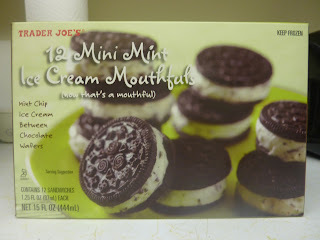 Well, I'll start off by telling you that these ice cream sandwiches are barely a mouthful. I expected them to be just slightly smaller than a traditional ice cream sandwich...but they're just a tad larger than an oreo in reality—like a regular oreo cookie. They're just one or two bites a piece. It works as portion control, which is good for people like me, who tend to overeat every chance they get. If I'm sitting there thinking "Wow, I've already had three ice cream sandwiches," I'm going to go ahead and stop eating. What kind of pig eats four ice cream sandwiches in one sitting? So it's a good, built-in reason to not snarf down too many at once. Another good reason to not snarf down too many: they're just not that good. It's really hard to screw up mint chocolate chip ice cream. And while it's not a total failure in this case, it does leave a bit to be desired. Sonia was thoroughly disappointed that it wasn't even green. I thought it had a green hue in certain lighting, but Sonia claims that it was stark white. Furthermore, there were very few chocolate chips. And finally, it wasn't really even that minty. It was a very subtly-flavored mint chocolate chip ice cream. Which wouldn't have been that bad, except that the flavor of the cookies completely overpowered the flavor of the ice cream. The cookies had a decent, natural kind of chocolate taste. Sonia thinks their flavor was similar to carob. I disagree. I don't like carob at all, but I didn't have a problem with the flavor of the cookie part of these sandwiches. What I did have a major problem with, however, was the texture of the cookies. Sonia wholeheartedly agrees. It's something that neither of us could put our fingers on exactly. We wanted to call them dry, but they're not really dry...we wanted to call them gritty, but that's not quite it either. There was just something about the cookies' texture that completely overwhelmed—and to a degree, ruined—all of the pleasant aspects of these little snacks. We both decided that the ice cream by itself with, perhaps, a few extra chocolate chips and some good old fashioned green #3 would have made a better treat. While the flavor of the chocolate cookies was acceptable, it totally overpowered the taste of the ice cream, and their texture was simply not pleasant. All in all, this is one of the more disappointing frozen snacks we've had from Trader Joe's. There's a novelty to their diminutive size, and the ice cream by itself would have had some potential, but neither of us are going to give these moderately-minty mouthfuls a stellar score. Sonia thinks they deserve no better than two and a half stars. I agree. I completely agree... I really wanted to like these, but they just weren't that good. I even bought them a second time, thinking that the freezer at work may have made them a little off, but they weren't any better the second time. However, thanks to this blog I now have the Journey to the Center of the Cookie sitting in my freezer and I'm really looking forward to that. these were just so-so... have u tried the other ice cream sandwich cookie? now that is good. They are quite stingy with the chocolate chips. Not as pictured. But I can eat several of these at once. Oink. This may sound radical, but it's ridiculously easy to make your own TJ's ice cream cookie sandwiches. Just pair up a quart of your favorite flavor with a yummy package of cookies. Texture is great, incredible flavor combos. The pumpkin ice cream with thin triple ginger snap cookies were to die for! Try your own combos. Much more cost-effective too. I purchased because I saw Mint Chocolate Chip, but they just weren't good. My son try them and he only ate one and left the rest for me.